I got a Ben Harper CD for Christmas. It’s really really good. I’m already having to restrain myself from buying more of his stuff right away. I’ll have to file him under the “Why on Earth Haven’t I Been Listening to This For Years?” section. Don’t you hate it when you discover an artist years later than you should have? Oh well, better late than never. 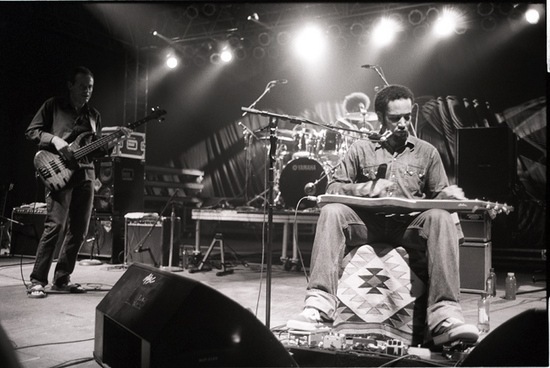 Lifeline (2007) is Ben Harper’s second-newest album. It has this great blues-rock sound to it that I just love. His songs have such a great swagger. I think he’s a pretty diverse songwriter too — from what I can gather Ben’s music on other albums also includes elements of reggae, rock, soul and folk. Really solid lyrics too. I especially like the line, “Promises and lies, both have their dangers.” Another thing I like about the album is the production (I’m picky about album production, it can make or break an album). This one has this great “live off the floor” sound because it was recorded and mixed in 7 days on a 16-track analog tape machine. No computers or pro-tools were used at all. Sweet. Anyway, here is a video of Ben Harper and his backing band, The Innocent Criminals, playing Fool for a Lonesome Train live in studio. Enjoy. you’ve gone over to the dark side. honestly, i can’t STAND ben harper. and i know, i know, everyone always hates me for a few seconds every time i announce it. honestly i’m so used to that sharp breath intake after my shocking anti-harper announcements i hardly even notice anymore. and i wish i didn’t. i really do. sigh. a girl i can’t stand was the first person to introduce me to his music…could that have something to do with it??? I really enjoy Ben Harper but I haven’t bought any of his new stuff. I think that Garrett was telling me that he’s gone more to the blues side…which I love. I can’t wait to hear it now.